The Journey Browser allows you to find Learning Journeys from our growing list of partners and authors. A Learning Journey is curated series of Lessons; each with Outcomes, Activities by an EdTech Provider or Magpie Author. They are mapped to the National Curriculum so you can plan and assess with ease. 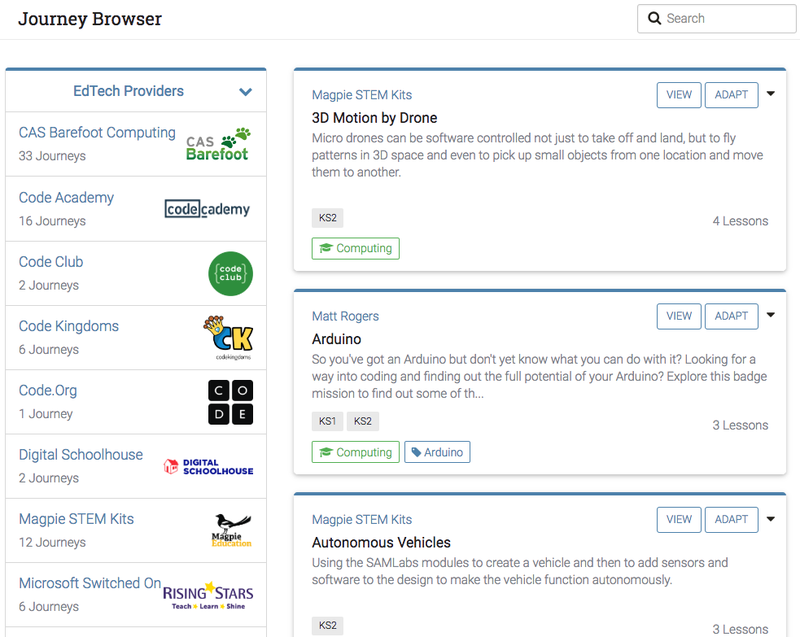 Browse through the list of EdTech Providers and Magpie Authors on the left of the screen. Clicking a providers' name, will display their Journeys in the list on the right. Search the directory of Learning Journeys by keyword, concepts or keystage. The filtered list of Journeys will appear on the right. Click a Learning Journey from the middle column to display its details in the right column. The details shows the Lesson Plan and Journey Coverage. Click "Save" to add a Learning Journey to your Dashboard. This creates a copy of the Journey, which you can adapt; share with your colleagues and use as Markbooks. Select a Learning Journey and click "Download to PDF" to use an offline version of the Journey in your classroom. Want Your Learning Journeys Published?